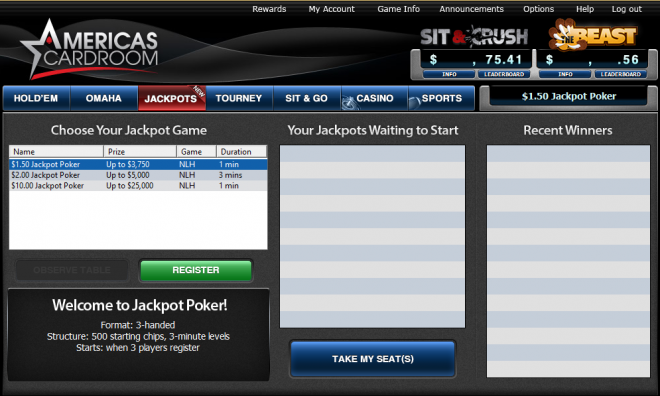 Americas Cardroom introduces a new way for players to win – Jackpot Poker. Play in these 3-player, Hyper-Turbo Sit & Go Tournament for a shot at 2500x your buy in. See our guide to the Lottery SNG format across the online poker industry. 1. Sign up to Americas Cardroom and make a deposit. 4. The random draw for the tournament prize pool will start once 3 players are registered. The award is between 2 and 2,500 times the buy-in. 5. The prize pool will then be displayed to all players. 6. The first hand will be dealt and the Jackpot Poker prizepool will be up for grabs. 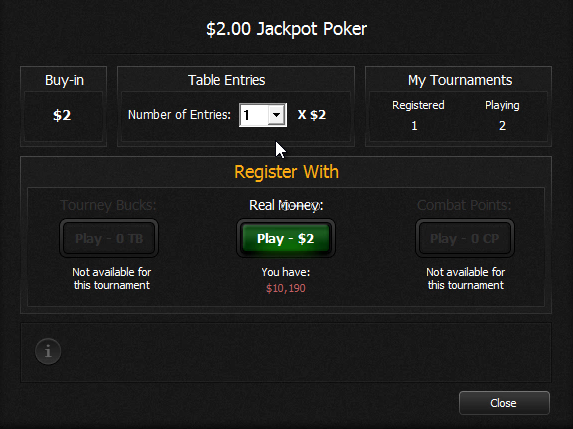 Jackpot Poker is a ‘winner-takes-all’ tournament unless one of the 3 highest prize tiers is hit. There is a default distribution but the players can also decide to make a deal. *Default distribution: 1st is 75%, 2nd is 15%, 3rd is 10%. Or a deal option which must be approved by each player: 1st 40%, 2nd 30%, 3rd 30%. 6% of the buy-in goes to rake. Jackpot Poker qualifiers for rakeback and bonus clearing as normal.